News flash: The live tadpoles and baby frogs sold at pet shops as fish food are of one species of frog - the American bullfrog. 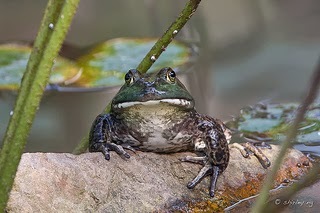 People who take these into the nature reserves should know that American bullfrogs are an invasive species. Tadpoles and froglets (young frogs) are more harmful as they disappear into the ecosystem. They will live within it eating and growing unseen by most. The local wildlife will end-up on their dining menu. Bullfrogs are indiscriminate feeders, they eat anything they can fit in their large mouths, which will put small birds, insects, fish, reptiles, frogs and mammals at risk. They can wipe out native species.